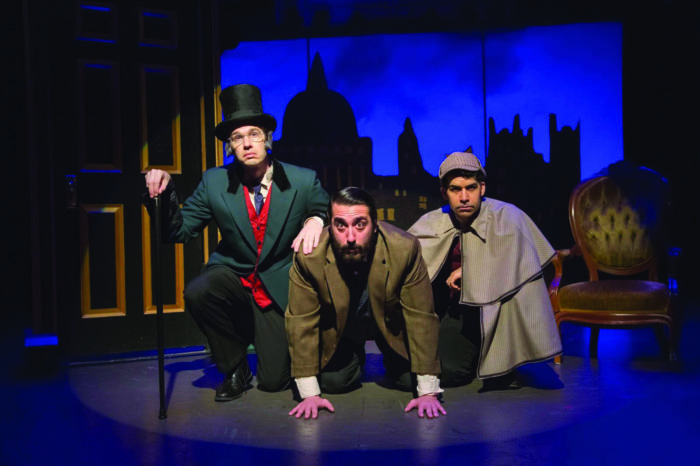 Axial Theatre’s April 6 Benefit: A Dual Celebration! 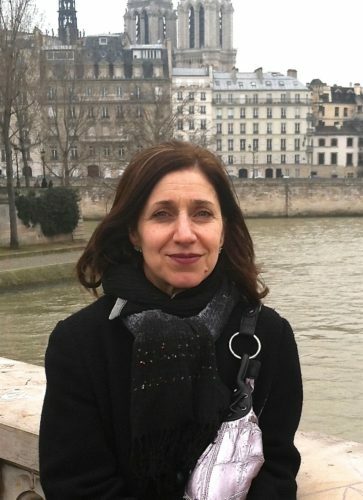 Westchester, NY – Axial Theatre’s annual spring benefit will be a special dual celebration this year as it welcomes the company’s new co-artistic directors, Catherine (Cat) Banks and Linda Giuliano, and ushers in a milestone year –the 20th anniversary of the professional theatre company based in Pleasantville. The event will take place on Friday, April 6, from 7 to 10 p.m. at the Gallery of ArtsWestchester and will feature cabaret performances by Axial singers; gourmet bites and libations from Jean-Jacques Culinary Creations in Pleasantville; and a live auction featuring a luxury getaway to the Italian Riviera and a South African safari. ArtsWestchester is located at 31 Mamaroneck Avenue in White Plains. The Banks-Giuliano duo will officially take over on September 1, 2018, the beginning of Axial’s 20th production year, joining Betsy Klampert, managing director and general counsel, as Axial’s leadership team. Howard Meyer, Axial’s founder and current artistic director, will remain the head of Howard Meyer’s Acting Program, and a member of the board. Banks began acting with her local award-winning children’s theater at the tender age of 11. Following college at University of North Carolina-Chapel Hill, she continued to study acting and founded her own production company, Bombshell Productions in New York City. She comes to Axial with over 20 years of high-level experience in business, having worked as senior vice president of operations for a financial services company prior to starting her own business in 2014. She is currently a member of Howard Meyer’s master class, a faculty member of the acting program where she teaches children and teens, and an Ensemble member of Axial Theatre. Banks will perform the role of Lenny in the upcoming Axial production of Beth Henley’s Crimes of the Heart this May. She appeared last fall as Audrey (one of the two leads) in Axial’s world premiere of Katie Baldwin Eng’s Nectar. Giuliano, an Axial Ensemble member for 14 years, has had plays produced through Axial, such NYC groups as Playwrights Horizon and Midtown Festival and with companies in the U.S. and Canada. A founding member of WritersGroup, a 25-plus-year-old group of six playwrights who write, direct, produce and teach in New York and Maine, Giuliano currently runs the Sunday Writers series at Axial, as well as Axial’s staged reading series wherein new works and classics are presented at various local sites. She has worked in mental health for 34 years as a licensed clinical social worker. The benefit’s cabaret singers will be accompanied by concert pianist Dan Forman; Axial Ensemble member Patrick McGuinness will serve as auctioneer. A silent auction also will be held. General admission tickets for the benefit are $60, including all food, wine and other beverages. For more information, visit https://www.brownpapertickets.com/event/3361706, Axial’s Facebook page or its Website; or contact Axial at AxialTheatre@gmail.com; (914) 286-7680. 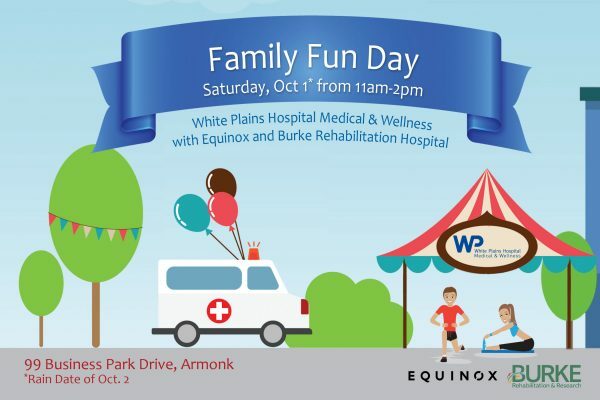 White Plains Hospital, Burke Rehabilitation Hospital and Equinox Fitness Club are partnering to celebrate the one year anniversary of WPH’s Medical and Wellness facility in Armonk with a Family Fun Day on Saturday Oct. 1. The event, which will feature a variety of games and activities for children and adults alike, will take place from 11 a.m. to 2 p.m. in the 99 Business Park Drive parking lot and is free and open to the public. Children can enjoy a day of fun-filled activities including a visit to the Ted E. Bear clinic, which uses stuffed animals to explain how to treat a variety of ‘boo boo’s and alleviate fears for children surrounding medical care. The first 100 children will receive a free teddy bear to take home. Equinox will also be on hand offering an array of classes and demonstrations to help families get active and stay in shape. For those looking to really break a sweat, the Armonk Fire Department will be running an obstacle course designed to be as fun as it is challenging. The new state-of-the-art White Plains Hospital Medical & Wellness facility will be on open for tours with physician meet-and-greets. Mammogram scheduling and on-site flu shots will also be available. The afternoon includes something for everyone including live music, balloon sculpture, raffles and free giveaways, food trucks and pumpkin painting, courtesy of DeCiccos. To give back to the community, guests are asked to bring canned goods for donation to the Armonk Food Bank. A rain date is set for Oct. 2. For more information call (914) 681-2628. The White Plains Hospital Medical and Wellness facility opened in late 2015 and features an urgent care center, comprehensive imaging center, and multispecialty outpatient physician practices in a variety of specialties, including primary care, pediatrics, endocrinology, neurology, cardiology and more. The modern, spacious facility is located at 99 Business Park Drive in Armonk, just off route 22 and I-684. White Plains Hospital (WPH) is a proud member of the Montefiore Health System, serving as its tertiary hub of advanced care in the Hudson Valley. WPH is a 292-bed not-for-profit health care organization with the primary mission of providing exceptional acute and preventive medical care to all people who live in, work in or visit Westchester County and its surrounding areas. Centers of Excellence include the Center for Cancer Care, The William & Sylvia Silberstein Neonatal & Maternity Center and The Ruth and Jerome A. Siegel Stroke Center. The Hospital’s Flanzer Emergency Department is the busiest in Westchester County, seeing nearly 57,000 visits a year. White Plains Hospital performs lifesaving emergency and elective angioplasty in its Joan and Alan Herfort, M.D. Cardiac Catheterization Laboratory and Marie Promuto Cardiac Catheterization Laboratory. White Plains Hospital also has outpatient medical facilities in Armonk and New Rochelle. The Hospital is fully accredited by the Joint Commission and earned its recognition as a Top Performer for Key Quality Measures® in 2015 and 2013. The Hospital is also an eleven-time winner of the Consumer Choice Award, an honor given to the nation’s top hospitals by the National Research Corporation, and received Magnet® designation in 2012 from the American Nurses Credentialing Center (ANCC). In 2014 and 2016, White Plains Hospital received the Outstanding Patient Experience Award from Healthgrades®, given to only 10% of hospitals nationwide. For additional information, visit http://www.wphospital.org. 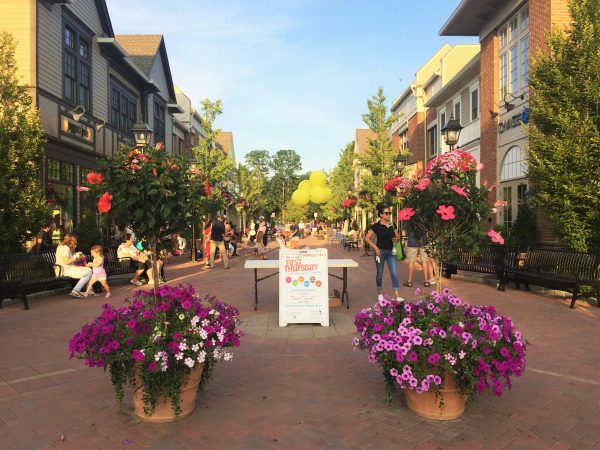 Armonk Outdoor Art Show Artist Preview! Last Chance for Free Raffle Drawings! Douglas Elliman: Free raffle for $250 gift certificate to Restaurant North (drawing Sept. 1). Refreshments. Rocks by Jolie B. Ray: Back to school savings! Access Physical Therapy: Free PT consultation or acupuncture treatment (call: 273-9100 on “First Thursday” to schedule). * In-Store promotions begin at 5:00 pm (except as noted), and some stores may not remain open until 9:00 pm. In case of rain, outdoor entertainment will be cancelled, but in-store promotions still apply. Check armonkchamberofcommerce.com for updates, business addresses and phone numbers. You MUST mention “First Thursday” to be eligible for any offers. Barbecue Ribs, Sliders, Steaks, Summer Salads and Local Farm Veggies, John Fazio’s Chickens, Lobster, Clams, Oysters and Wild Sustainable Seafood of every sort. The Amy Marie Crabtree Foundation, named for John Crabtree’s (owner of Crabtree’s Kittle House) wife (the Amy of ‘Amy’s Garden’) who passed away after a valiant fight with brain cancer in 2009. Amy was a passionate person who felt strongly about causes that helped women, children, and helpless animals. The Foundation raises funds to find a cure for the horrible disease *Glioblastoma Multiforme that took Amy’s life, and provides financial support for the causes she dedicated her life to. is a brain disease that attacks even healthy, active people like Amy. Fewer than 5% of the people afflicted with the tumor will survive.